Here’s a fun & free printable Mother’s Day Word Search for your kids to play. The searchable words are all the wonderful gifts mothers would like to receive on Mother’s Day…notice that sleep is the first one listed! This is a fun game for the kids to play during a special Mother’s Day themed brunch or perhaps on the car on the way to grandma & grandpa’s house. Do you ever celebrate Mother’s Day with your parents or your in-laws? What are your favorite Mother’s Day traditions? Let us know in the comments below. All of the words to search for are listed on the bottom of the free printable game. 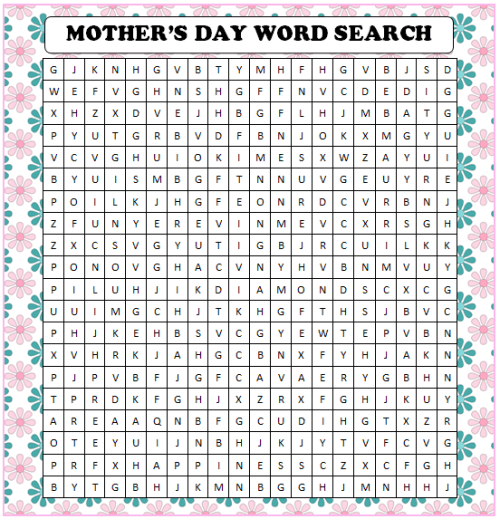 If you could add some special “gift” ideas to the Mother’s Day Word Search, what would you add? A mini vacation? A new book? Some gardening supplies? A family movie date? A delicious waffle breakfast made by your kids? Do you remember what you did last year for Mother’s Day? My son was born the day before Mother’s Day last year and it was the best Mother’s Day ever! It will be hard to top that one for sure. For more fun Mother’s Day ideas, check out our Holiday Fun page and scroll down to May to see all of the Mother’s Day ideas. If you’re planning a special meal for Mother’s Day, we also have load of delicious recipe ideas on our Recipes page. Have Fun & Happy Mother’s Day! We’re always adding new ideas to enjoy as a family. To stay updated on all the fun, follow us on Facebook, Twitter, Pinterest or our new RSS feed Bloglovin’. The under the sea party is so cute! I love all those ideas. Hello from SITS and I am now following.